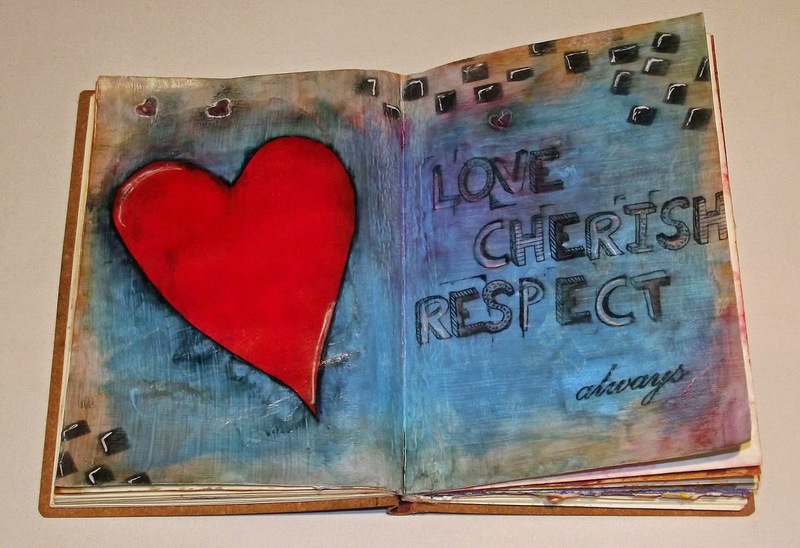 Today I am posting a recently completed Art Journal Page titled Love Cherish Respect. This page started out totally different to how it ended up. But that is the beauty of Art Journalling. It is a wonderful messy, creative and fulfilling process ( for me anyway) that you don't know where it might lead. The page was prepared with Gesso to give the acrylic paints and inks somthing to cling to.Some acrylic paint mixed to create the background and the stamping was done with Tuxedo Black from Memento Inks. I cut out the heart from red card and used Modge Podge to adhere it to the page. I made a template from a sheet of clear transpareny film ,cutting out a tile pattern, and dabbed black ink over to get the irregular block effect. some distressing with tim Holtz Vintage Photo ink and black markers pens with a white gel pen completed the look I was after. The layer of Modge Podge to protect the finished page created a nice sheen to the page and produced a great canvas texture as a bonus. Hope you like my attempt at Art Journalling. I've got the bug for this and I have some ideas for new pages. Like I said, seem like the Mojo is finding it's way home. Thanks for stopping by to read and comment on my blog. Your time and comments are much appreciated.